Relationships and responsibility — along with an engaging personal warmth — run through the narrative of T A Duckworth’s story. These principles explain the context of a man, called by associates as “Wausau’s number one citizen,” whose hard work and belief in the area’s success continue to impact our community even today. T A — his given name — was born in Albany, Missouri on March 26, 1912. He attended Central Methodist College in Fayette, Missouri and graduated from the University of Missouri Law School in 1936. After passing the Missouri Bar and considering serving as a county prosecutor, T A accepted a position as a claim adjuster in the Kansas City, Missouri office of Employers Mutual of Wausau; after three years, he was promoted to the office’s legal manager. In 1941, he and Edwina Nelson married in Boonville, Missouri and in time the couple had three daughters, Sally, Celeste and Jane. In 1943, following service in the Army Air Corp, a short-term move to Wausau found T A serving as the assistant to Employers’ general counsel. Thankfully, the move turned permanent with T A staying in Wausau for the rest of his life, becoming the company’s personnel director in 1944. T A’s rise within the company was a bit unconventional. He wasn’t a salesman or an insurance professional by training. He was, however, the consummate “people person”, known within the company and the community as a gracious, open-minded leader. Following his promotion to corporate secretary in 1957, other promotions came quickly. In 1960 he became senior vice president and secretary and in 1974 was promoted to executive vice president, and named as a director. The board elected T A as president and chief executive officer in 1975. 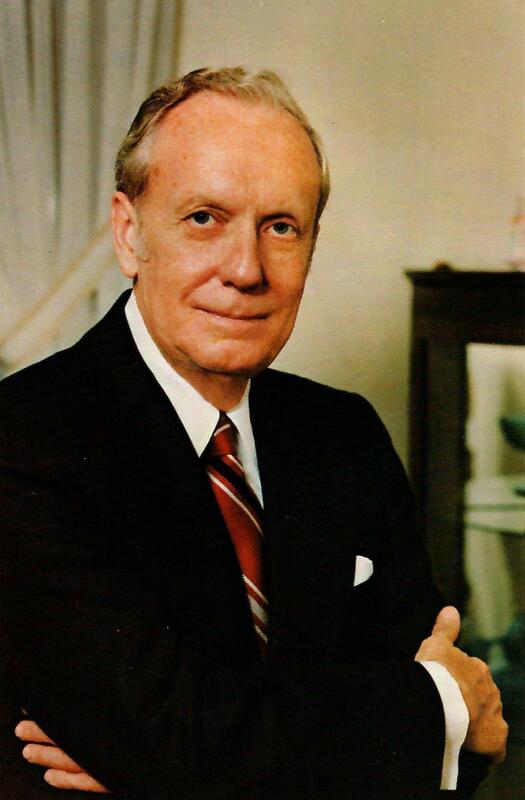 In 1977, having reached the company’s mandatory retirement age, T A retired from Employers and was named chairman of the board, a position he held until 1981. T A’s civic work was also remarkable and he approached those responsibilities with modesty and dedication. The running joke was that in Wausau, T A stood for “The Answer.” He served on the Wausau Schools Board of Education, as a trustee of Lawrence University and the University of Wisconsin Marathon Center Foundation. T A was involved with many organizations with a health focus, such as the Wausau Hospital Center, American Lung Association, Wisconsin Public Health Council and helped found the Visiting Nurse Association. He was a member of the corporate boards of Forward Communications and First American National Bank. He was also the president of the Wausau Chamber of Commerce, board member of the Leigh Yawkey Woodson Art Museum, member of the Rotary Club, and involved with the Marathon County Red Cross, Wausau Housing Authority and Woodson YMCA. He was named Wausau’s Citizen of the Year in 1975. T A was also a man of great faith, serving as an elder and Sunday school teacher at the First Presbyterian Church. Nearly 73-years-old, he passed away on Feb. 7, 1985. As T A retired from Wausau Insurance in 1977, he told The Daily Herald, “The only way I know is to do the very best you can at your present job, wherever you are.” That was an accurate explanation of a man who could be counted on professionally and personally for his decency, humility and generous spirit.